Our summer exhibitions are always the highlight of the year here at RAINMAKER and the next one is fast approaching. This year’s show FIRST PEOPLE, SECOND CITY opens on Tuesday 17th June. To launch the exhibition we have an exciting day of special events that give you a rare opportunity to gain greater insights into Native American cultures past and present, to meet the artists and discuss their artwork directly with them and to have a thoroughly good time. So book the afternoon off work and head to Bristol to welcome our visiting artists Chris Pappan and Debra Yepa-Pappan from Chicago. Dr Max Carocci from the British Museum shares his passion for Plains Indian culture whilst explaining the fundamental differences between American Indian biographical paintings and traditional European portraiture. Through the art of Chris Pappan, we learn how these distinct depictions converge in contemporary Native American imagery, presenting an often uncomfortable dialogue between Indigenous peoples and colonisers. 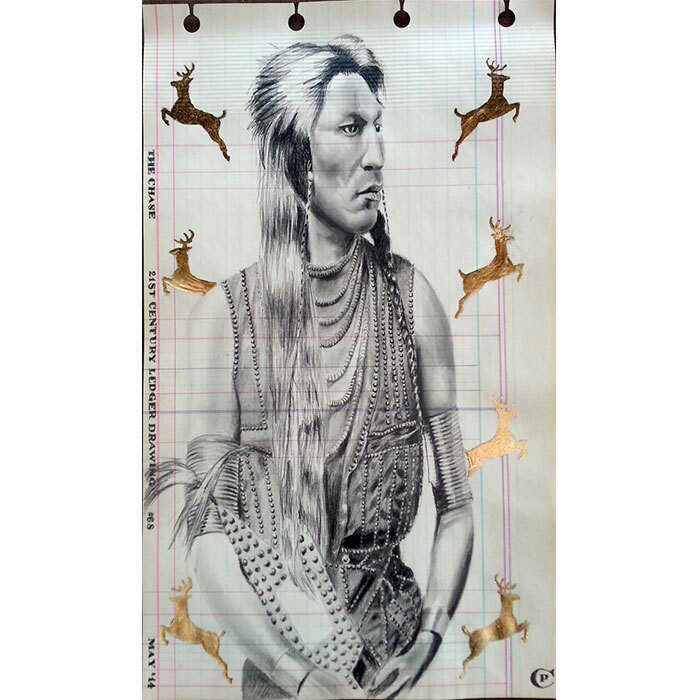 Chris Pappan will speak about his work in this exhibition, his evolution as an artist and the origins of Native American ‘ledger art’. Debra Yepa-Pappan will share her experiences growing up in Chicago as a Jemez Pueblo Native American of Korean descent and the positive impact this has on her artistic output. FIRST PEOPLE, SECOND CITY officially opens at RAINMAKER between 6pm and 8.30pm on Tuesday 17th June. That leaves plenty of time to stroll up to Coldharbour Road from the RWA following the afternoons events. Pick up your preview invitations from Rainmaker. To book for the lecture and talks call Rainmaker on 0117 944 3101 or email jo@rainmakerart.co.uk.